Will this be your first visit to Trinity? Unsure what to expect? Visiting a church for the first time can be an intimidating experience. Many find it difficult to enter a church with lots of people who know each other and who don't know you! We want you to feel welcome at our church to experience the presence of God in the fellowship of other Christians. When you arrive at our church, you will find parking in the lot which can be entered from Chapel Ave. Handicap parking is available in the rear parking lot. 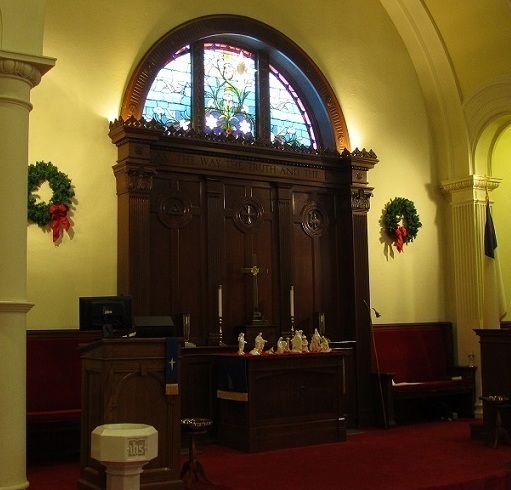 Our church has many entrances, those that are primarily used on Sunday mornings are the doors that lead immediately to the Sanctuary which are located on the corner of Maple and Chapel Avenues and the entrance on the west side of the church which can be accessed from the back parking lot. The west side entrance offers elevator access for those who require it and posted signage to help first time visitors to easily find their way to the Sanctuary. When you arrive, you will be greeted by a friendly church member who will be happy to answer your questions and help direct you to the nursery or worship. What is the worship style at Trinity UMC? Worship service is held in the Sanctuary at 10:45 a.m. All are welcome to participate,including families with children. A nursery is also available for young children. A typical service lasts about an hour and includes an inspirational sermon from our pastor, Rev. Walter Mander, and a nice blend of traditional and contemporary music from our Chancel choir, organist, and musicians. Communion is served on the first Sunday of every month. Everyone is welcome to join us in Fellowship Time immediately following worship service in the adjoining Chapel area. This provides church members and visitors a time to enjoy coffee, light snacks and conversation. What do people typically wear to worship at Trinity? There is no dress code at our church! Many of our church members come to church in "business casual" clothes, but jeans and t-shirts are also OK. You are welcome to come just as you are! We wish you every blessing for your upcoming marriage. To find out more about weddings here at Trinity, click below to read our Wedding_Arrangement Brochure. a baptism for your child or yourself? To read our Guidelines for The Sacrament of Baptism < click here. If you would like to read more about a United Methodist understanding of baptism click here.